This ring shows the Claddagh, it is 14ct white gold. Made in Ireland. Heavy Traditional White gold Claddagh Ring,This claddagh is a heavy weight "Puffed heart" version of the ring. 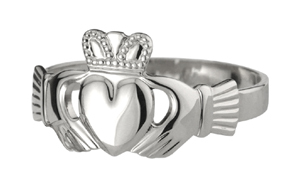 This claddagh is a heavy weight "Puffed heart" version of the ring. us for an exact lead time if required.